We attended an eco-festival on Sunday 23rd September in Colerne, Wiltshire (UK). This is the banner we made to place on the front of our stall. It's made with vintage floral fabric, vintage buttons and recycled pre-loved denim fabric. 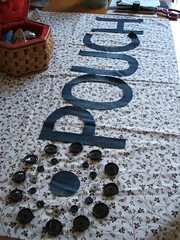 I will blog more details about the festival tomorrow and show the banner in action on the front of the stall! Love this banner it's brilliant.